This book is enjoyable and readable, with a light touch in places, the humour of real life situation most of us can recount. I think the true greats have no need of pretension, walk straight and recount the path of discovery. Figure 1.2 shows a beer bottle and funnel on a lawn. As fate would have it a daft experiment, the kind some do, ended with trying to find enough containers, it rained and rained in Denmark. He had access to a mass spectrometer, samples 1, 2.. 15 were his discovery of the 18O proxy of temperature as huge frontal system passed over, about the temperature of the cloud. Greenland is Danish, co-operatively the United States were highly active there during the cold war, particularly Camp Century where drilling the ice to bed rock was done. When things calmed down Dansgaard was given access so quite a tale follows. There are many interesting photographs. He commented about cod and overfishing but later seems to contradict himself with the following perplexing paragraph, I’ve emphasised. After his retirement in 1992, Willi Dansgaard wrote an autobiograhic book in Danish, Grønland i Istid og Nutid (Rhodos, 2000, ISBN 8772457996). Later, he wrote an English version, Frozen Annals, which focuses more on the scientific part of the story. The book can be downloaded as a pdf file. Frozen Annals, what a great book. 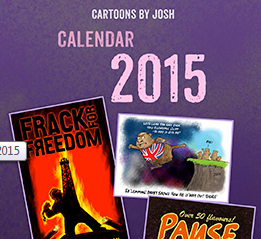 I’ve only skimmed through right now but I will read it tomorrow – and for free. Thanks Rog. Dansgaard was definitely a great among the greats. Thanks for the link to the book. Would that have been the abrupt drop in northern hemisphere sea surface temperature around 1970. Thanks for the ref–a fine example of history of science told by the guy who did so much to establish iceberg and ice core analysis. He has a wry and dry Scandinavian sense of humor that makes it an enjoyable read. That’ll teach him not to sit on the ice. Frank, blimey, you did well to find that piece. That could be material for a blog article. Something does not make sense. The Nature article is dated 2010 and this has only just been noticed? Begs the question of what sea ice has done since then. Hang on, this fits with some comments by a student of Overpeck, may have mentioned this in the past. Okay I’ll reveal why I took an aside into ice cores. Something had been troubling me about the ice core gas figures where a hare brained idea has appeared for a cross check. Not done this yet but it led me to once again dig out gas solubility information. This time I spotted gas solubility is about 30% lower in brine, sea water, than in plain water. 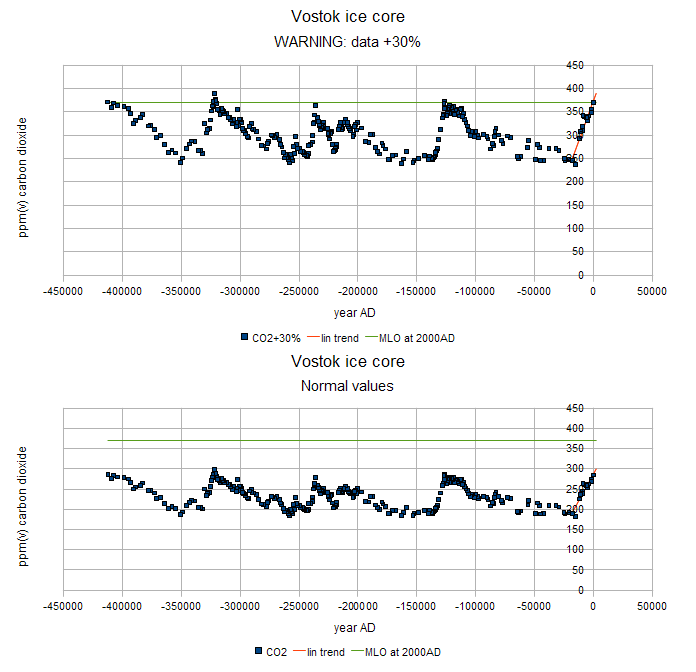 Out of curiosity I pulled up Vostok ice core data here, added 30% to the figures, plot, gawp. Exactly in line for how it is today, there is a 30% deficit. Something so stupid could not be the case but it is frozen fresh water which would be below equilibrium. I’m well aware ice core people are very sniffy about gas extraction, something about wet extraction gives bad results. As anyone would do I started to try and confirm my understanding, odder and odder, blanks on many “obvious” searches. What I found was crazy obfuscation, unsupported claims/excuses, just how it is done, propagandist language, but nothing so far which smells of honesty. I know it is a complicated situation, lots of strange things going on but also how certain obvious experiments have never been done, one of the reasons why I am sceptical about ice cores. And that is how I came across the book. I’ll give it a break now. Out of curiosity I pulled up Vostok ice core data here, added 30% to the figures, plot, gawp. Exactly in line for how it is today, there is a 30% deficit. Tim Cullen, I’ve a draft post ready but might not published the witterings, not decided. Heck of a post you have at malaga bay. Thanks for putting up the graphs… very interesting! Anchor Ice rises from the bedrock. Anchor Ice forms in seawater. Greenland and Antarctica have inland depressions that could have been full of seawater. So do “ice sheets” start forming from the top down [fresh water] and the bottom up [sea water]? I really hope you follow through and post your sources, observations and thoughts. I think that is best tackled by someone with a good knowledge of whatever science it is. My actual knowledge is in far removed detail areas. There is a lot of valid criticism which continues unanswered, very telling. @ Ian Wilson I followed the link but was left to wonder if one implication of an expected sudden increase in temperatures in 2150 must first be preceded by a steady fall in temperatures until then. Last 20,000 years of GISP2, graticule at 1470 years. Why there are so many changes in ice core detail is a mystery. D-O events in the Pleistocene (Ice Age). All but D-O events 0 and 1 occur prior to 22,000 before the present. 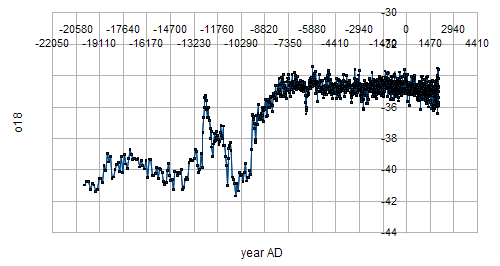 D-O event 1 is on the leading edge of the first temperature spike at ~ -12,000 years and D-O event 0 is at the sharp rise in temperature at the end of the Younger-Dryas at ~ -9,000 years. i know that there will be most likely be general cooling until 2040 but i cannot say what will happen between 2040 and 2160 with any great degree of certainty. It is always possible that we will enter next ice age before then. Ian, I am acting as a foil. The time grid is at 1470 years. Why are there no obvious recurrences given about 15 chances? Are you saying they only happen during an ice age? If so why? Thanks for being a good foil. Unfortunately, a lot of people want all the answers and they want them now. Science is not like that. Most times when a possible scientific explanation is given for a phenomenon it raises more questions than it answers. Nature always seems to be very reluctant to give up its secrets. a) the strength of the forcing for any given D-O event changes with time so that some events fall short of exciting the internal resonances. b) conditions have to just right to excite these resonances. a) Your grid is not in (time-)phase with 1470 year cycle. b) 8 of the 15 (~53 %) possible events are in the Holocene (modern warm period) where you have used the wrong vertical scale to highlight the much weaker Bond/D-O events. Indeed, it could be argued that it was the D-O events that jump-started the Holocene warming that brought us out of the last ice age. 1) DO event 1 started the first failed attempt at warming. 2)The warming slowly faltered over the next 1500 years and even DO event A was not enough to kick-start another round of warming – leading to the Younger-Dryas cool period. 3) Finally, DO event 0 got the motor turning and the climate system made the transition from the Pleistocene to the Holocene. Support for this argument is given by the short time scales associated with the temperature changes over this transition period and the alignment of the three DO events with the crucial jumps in warming. This probably adds to the 100ky mystery of why there is change of behaviour. I’m still not convinced d18 is really showing temperature even though that can be true. What Cullen is showing does bear consideration, indeed why do colour images reveal what monochrome doesn’t. IIRC there are similar events believed dropped by icebergs. Do these match up? I cannot take Tim Cullens post seriously since there are many other proxy indicators that indicate when delta 18 indicated a cold climate there was in fact a cold climate. These are the Bond events of the Holocene. I can well understand your reaction. However, it is also difficult to take the “settled science” seriously when it thinks July 2003 meltwater is from the Eemian. The Greenland “ice age” narrative represents a massive “confirmation bias” failure. Therefore, it is prudent to look for “confirmation bias” in other studies. Personally, I don’t take any “settled science” for granted. Personally, I think in prudent to check any “fact” produced by “settled science”. The Lawler link includes another link provided by Geoff Sharp. That was also around the time of the phase change of the Chandler wobble. Great chart, Tim, which shows little change in temperature (between +/- 1 degree) for the last ~10,000 years. Compared to the wildly oscillating previous period, looks like something significant has changed in the system. Some evidence for major structural changes to the Mid-Atlantic ridge at about the same time-scale, which has allowed the Gulf Stream to follow a more northerly course? I applaud your efforts to question the “established” consensus and I encourage you to please continue speaking out when ever you see inconsistencies in the analysis of the observations and data. We need people like you in order to advance science. There is still a lot that we have yet to learn about this period and your research will help give a clearer picture of what actually went on during the last ice-age.